When I contemplated my move to France, I knew there would be many, many things to learn about living in another country. I expected the really big things....like learning the language and becoming proficient in French manners. You know..the manners that dictate you ALWAYS say 'bonjour' when you enter a shop and ALWAYS say 'au revoir, merci' when you leave. Big things like becoming familiar with traffic and directional signs and wading through the bureaucracy to have utilities turned on. What I didn't expect were the little things that seem so simple in the States, yet seem to trip me up here. Little things like remembering to weigh and tag my own produce at the grocery store and always coming prepared with a euro coin in my pocket to release the grocery cart for use. Little things like writing a check! I've probably written out hundreds of checks in my life. 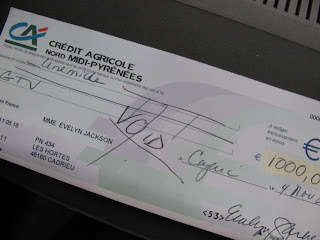 My dad was a banker; I know how to write checks...I thought! When I looked at my CA checks yesterday to write one as a deposit for my car, I felt like I needed a check writing 101 class. 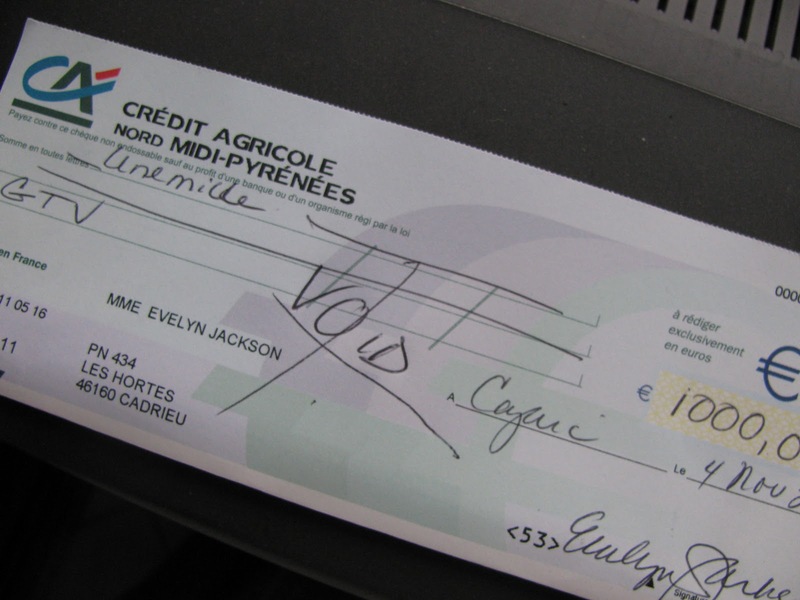 For starters, the written amount comes first, then you write in who the check is made out to. There's not only a place for the date, but also you have to fill in the location where you wrote the check. And trying to figure out how to write French numbers in words?? Let me tell you...it took both Jean and I to do it, and then it still wasn't correct. Thank goodness for the nice woman behind the counter. With her help, I finally got it done. I'm sure she spent the rest of the day shaking her head in amazement at my inability to do this simple, little thing! Oh, did I mention I bought a car? You'll hear the rest of that story next week. Language and manners are the small things. Things that can be taught. The big things are the rest, the things only time can teach. In the end those are the things that change you and make you learn about yourself more, not a foreign language. I don't agree with David. 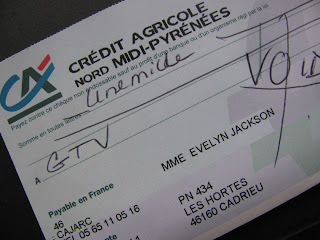 I've had my French checking account for over eight years and I still have to stop and think when I write a check. The layout is so completely opposite of what we are accustomed to doing with a check from a US bank. US bank or credit union checks are all laid out the same way. French bank account checks all the same way...and a reverse of what we have learned to do so automatically. It takes courage to step out of one's comfort zone and to live in a different country and culture. Bravo, Evelyn. Joanne...I don't agree with David's comment either, but found it intriguing to be challenged about just what the 'big things' are when you live outside your comfort zone. I may do a post on that! I guess the point of the post is that I expected big things to trip me up, but not the little things that should be 'no brainer's like writing a check. I don't think anything is really a 'no brainer' in France!! At least, not yet for me.